State Government would be providing land and all other possible assistance for setting up of The Energy and Resources Institute (TERI) for setting up its Regional Centre in the State to help State in providing technical guidance in area of Climate Change and Environment Protection. This was revealed by Chief Minister Prem Kumar Dhumal in the inaugural function of the State Centre of Climate Change, after laying its foundation stone, here today. 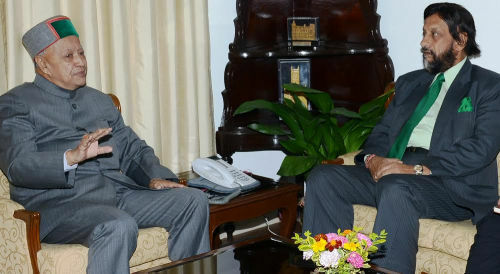 Chief Minister said that the State Centre on Climate Change and Department of Environment would enter into technical Memorandum of Understanding for areas of cooperation in sectors like Climate Change, Energy Efficiency, Agriculture/Horticulture, Bio-Technology, Climate Change and Modelling Sustainable Development etc. He reiterated the resolve of the State Government to promote green growth across all sectors of the economy without compromising its net growth rate. 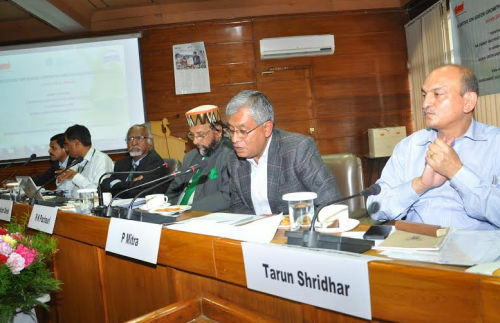 He said that the Government was working closely with local communities to assess the carbon footprint at the Panchayat level, and was developing its hydro power resource which will reduce the carbon intensity of India’s power sector and address peak shortages. He said that no effort of the Government would achieve its ultimate objective without the active involvement of the masses hence all policies were being implemented successfully with people’s participation. Prof. Dhumal supported the proposal of the renowned environmentalist, Nobel Laureate and Padam Vibhushan,- Dr. R.K.Pachauri of constituting a Global Union of Mountain States to check emission of green house gases and preserve the climate of hill States all over the world. He said that the idea of constituting Trans Himalayan Development Authority was mooted in year 2001 when Atal Behari Vajpayee was the Prime Minister of the country. He said that different parameters were required to be adopted for speedy development of hill states whereas all States were being governed under same parameters. He said that the State Government would also be extending all possible help to the World Bank for implementation of projects directed towards protection of environment. He said that the State Government had taken a number of initiatives to mitigate the problem of climate change and global warming by checking use of plastic carry bags followed by plastic cups and plates etc. He said that developed countries had been responsible for maximum emission of green house gases and should continue to provide adequate funds for research and development activities in the sector so that the impact of climate change and global warming could be mellowed down. He said that the State was poised to emerge Carbon Neutral State of the country in near future. Chief Minister also released Inventory of Himachal Pradesh on Green House Gas Emission. 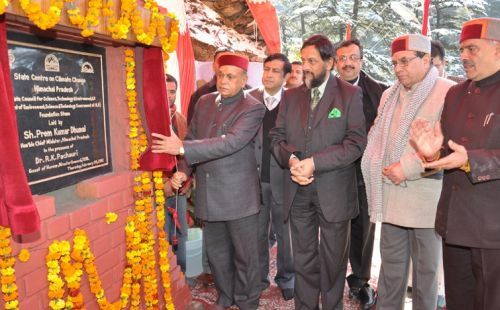 Dr. R.K.Pachauri lauded initiatives and achievements of the State on environment front by saying that the Himachal Pradesh had established its credibility as motivating force in protecting the environment and setting up of the State Centre for Climate Change was a step forward. He congratulated Prof. Prem Kumar Dhumal for his vision and initiatives which had been supported by the public in general voluntarily. He said Himachal Pradesh had taken lead in preparation of GHG Emission Inventory in the country. He briefed the activities of TERI and said that it would be providing bio-mass base and bio-vision to the country to deal with climate change threats successfully. He underlined the need to reorient thinking and save energy to enhance economic prosperity. He also stressed strengthening of information system down to the grass root level. He warned of global warming by 1.5 to 2.5 degree celsius which could threaten existence of 20 to 30 percent of the living species. He said that droughts, floods, change in season cycle were evidences of change in the climate. He recommended constitution of Global Union of Mountain States to protect environment and thereby check climate change. He assured the State to join hands to make Himachal Pradesh energy efficient, industrially developed and consume local raw material gainfully. Dr. Pachauri also launched Web Portal of State Centre for Climate Change on the occasion. Chief Secretary Rajwant Sandhu said that the State had rain fed agriculture and major chunk of population was engaged in agriculture sector for its sustenance. He said that the State was sensitive towards environment protection and had organized Chief Minister’s Conclave and issued Shimla Declaration to protect environment and the same was being implemented in letter and spirit. She said that awareness down to school level was being created through different campaigns. She said that the State Government was motivating rain water harvesting keeping in view the possible water scarcity due to change in climate. Additional Chief Secretary S.Roy welcomed the Chief Minister and Dr. R.K.Pachauri and delved upon the initiatives taken by Himachal for the sustainable eco-system in Himalayas. He detailed the steps initiated by the State in checking use of plastic use in the State. Dr. Nagin Nanda, Secretary, Environment, Science and Technology, gave a detailed presentation on the global green house gases emission scenario and said that United States happened to be the top in the list in the world which stood at 24.1 percent of the total while it was 1.6 percent in India and out of emission of 17,27,706 thousand tones emission of GHG Himachal had only 10,983 thousand tones which was lowest in the country. He said that the State was in the process of preparing basin-wise CAT PLAN. A.Vikram, Joint Secretary, Environment, Science and Technology, Govt. of Himachal Pradesh proposed vote of thanks. Suresh Bhardwaj MLA, Ms. Harinder Hira, P. Mitra, Additional Chief Secretaries, Dr. D.S.Manhas, Director General of Police, Principal Secretaries, Secretaries, Special Secretaries, Heads of the Departments, Vice Chancellors of different Universities in the State, Shri Herbert Acquay, Director World Bank, Dr. Charles Cormier, Sector Head, World Bank, environmentalists, and prominent people from different organizations were present on the occasion.